Located a mere hour outside Tokyo in Saitama Prefecture, Kinchakuda Park lies on a forested bend along the shores of the Koma River. 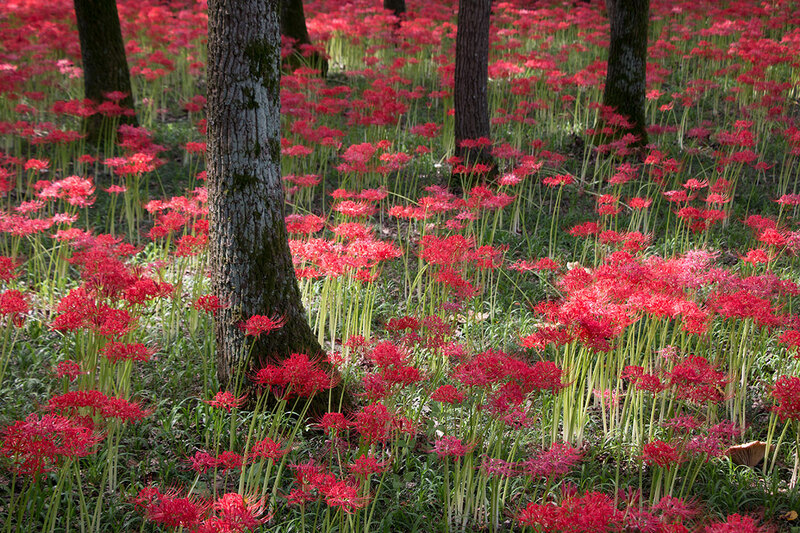 For about 8-10 days each year, a spectacular red carpet of lilies forms beneath the trees creating a fairy tale scene unlike anything we have ever encountered before. Clearly, as the peak bloom occurs for only a few days and the park is located just outside one of the planet’s largest cities – you will not be alone during your visit. But the park is well organized with defined paths to protect the flowers and allow visitors to freely explore and photograph to their heart’s content. 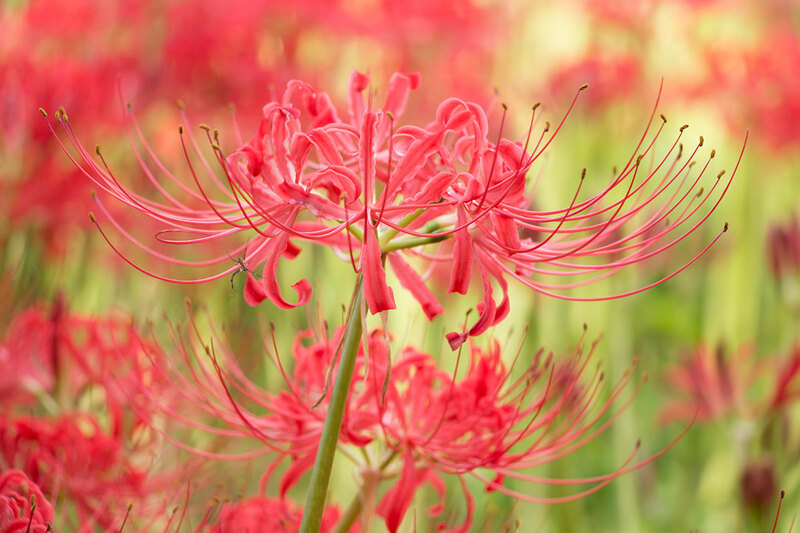 Beyond being beautiful, red spider lilies have a symbolic meaning. 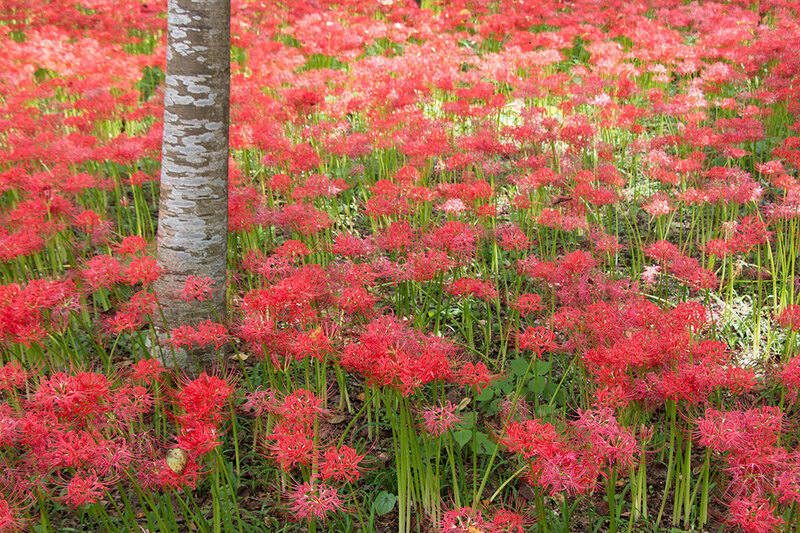 The flowers mysteriously bloom right around the autumnal equinox and are associated with the coming darkness of winter. 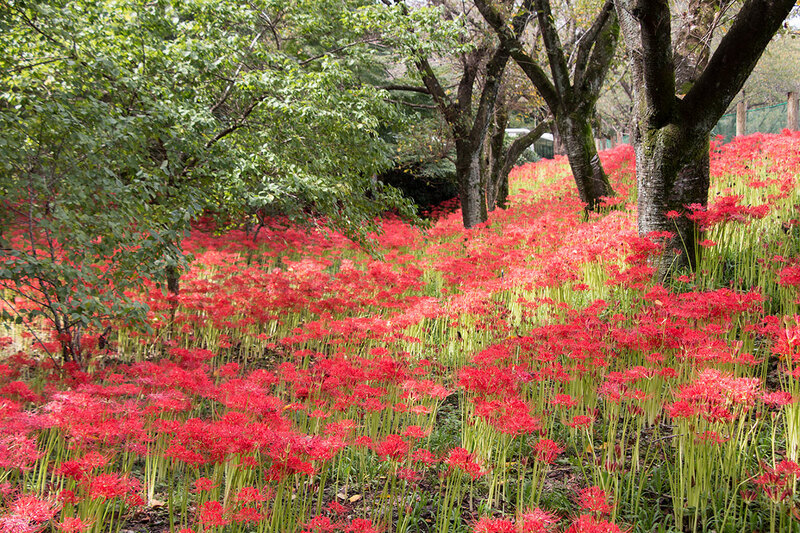 Over time, this fact has led Japanese to associate the flowers with the transition between light and dark, life and death. 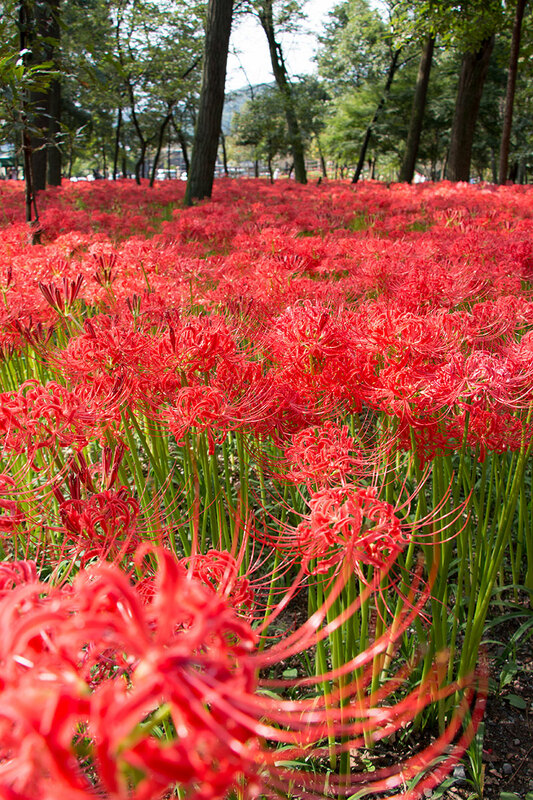 Japanese often plant the beautiful, bright-red flowers around cemeteries to placate spirits and create a colorful boundary between the world of the living and the netherworld beyond. Hey, we should use these flowers as Halloween decorations. 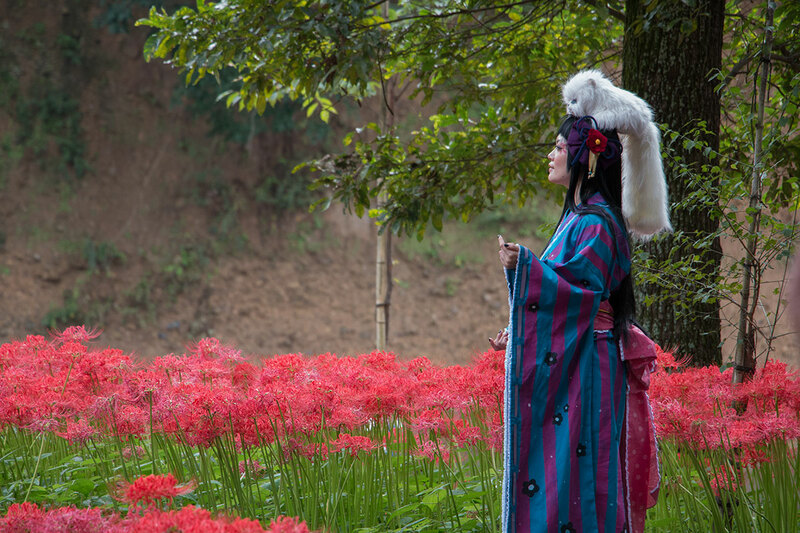 As you can see from the pictures below, the flowers and the forest scenes are quite stunning. Before you accuse me of going crazy with Photoshop, I should explain the wild colors and lighting. 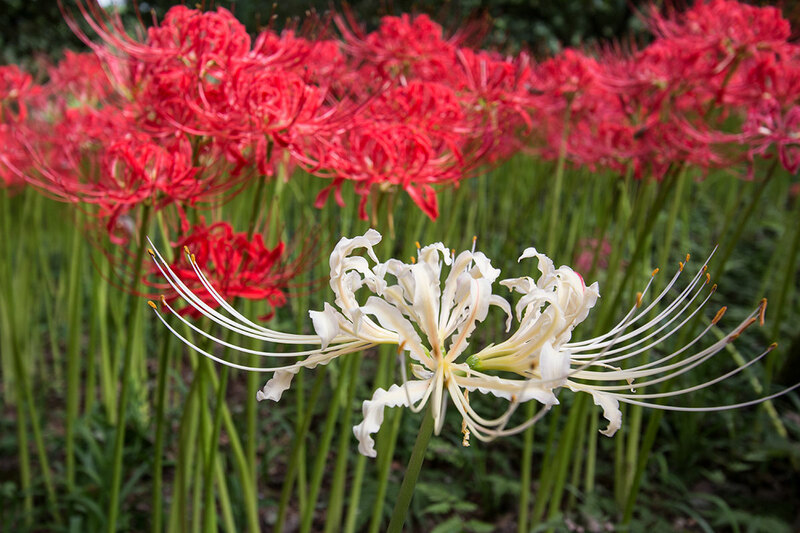 As the flowers bloom, they start with a very pronounced white outline along the petals, which makes some of the flowers appear pink from a distance. The white outline gives the flowers a very odd, surreal quality as well, which was greatly enhanced by a sky of Swiss-cheese clouds and sunbeams. 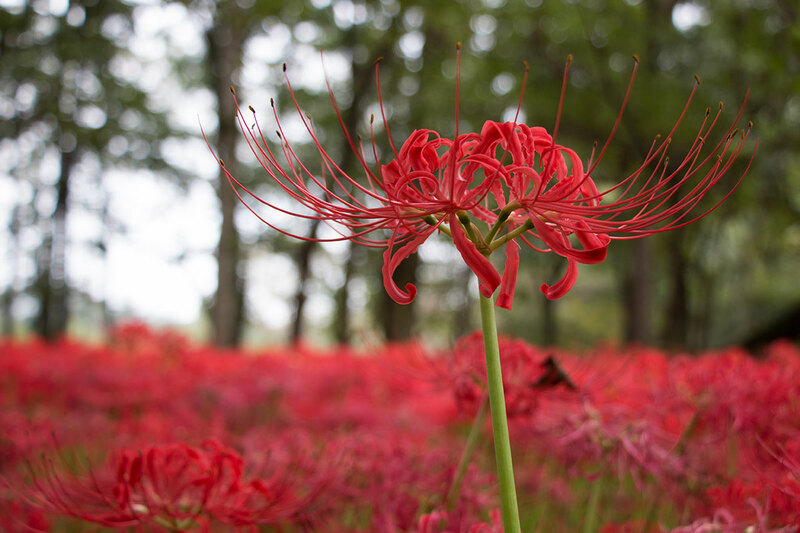 If fairy tale flowers aren’t enough, I should also point out that just outside the forest, locals hold a Spider Lily Festival full of amazing regional foods and desserts. 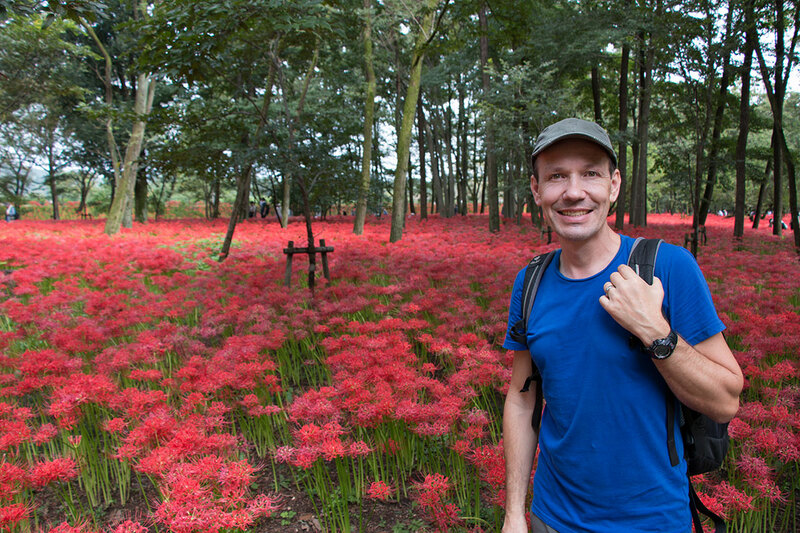 Seriously, what is better than an awesome natural phenomenon AND Japanese street food? Ummm, nothing. See tips on visiting at the end of this post. Is that a cat on her head? I’m on the path, don’t worry. 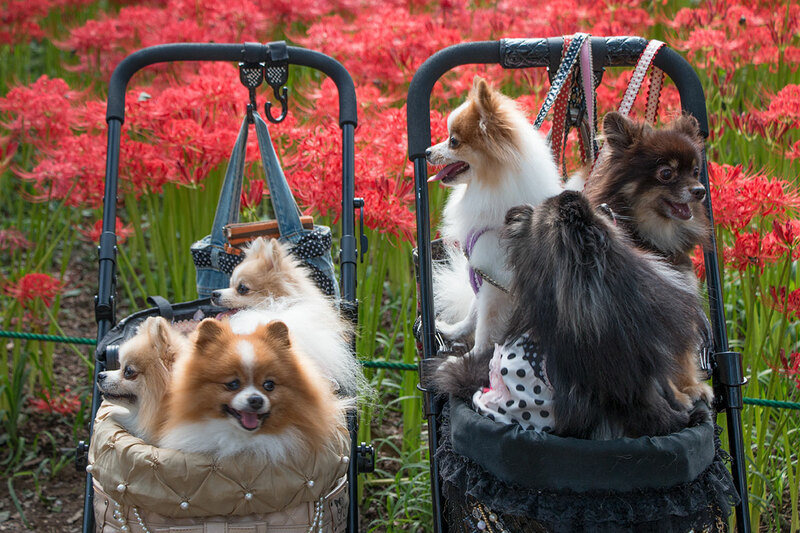 You might even see dogs in baby carriages! 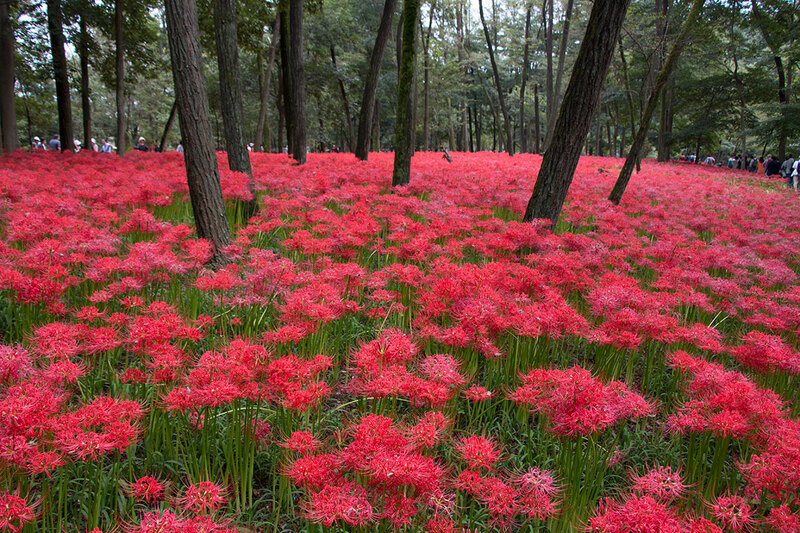 The red spider lilies bloom in late September and usually reach full bloom around the autumnal equinox Sept. 22/23. 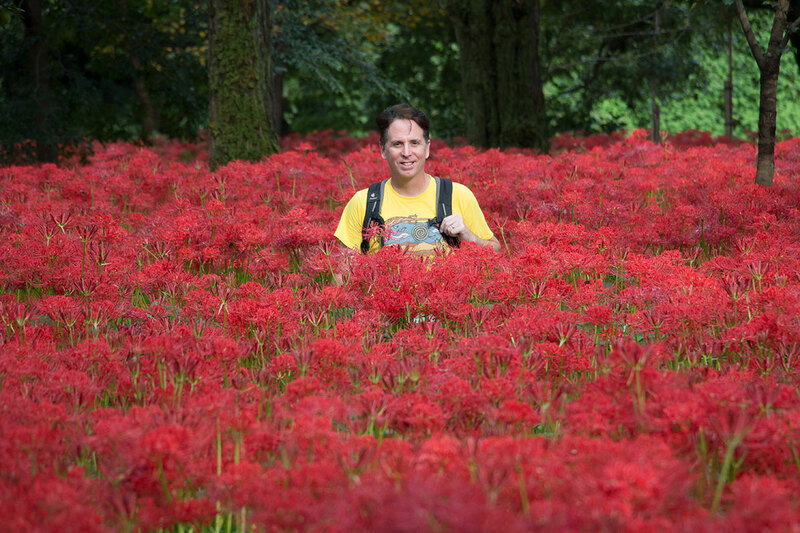 Shortly before the bloom, the park website will put up a calendar predicting the peak of the bloom. Unfortunately, that page is removed after the bloom, so I can’t link to it. Also, if you like colors as much as we do, feel free to check out our colorful post Kyoto Autumn Leaves. I know, that’s what I said when I took this picture. The whole place is photographic gold. Very beautiful. Just looked at all the pix. Big wow!! I know. Isn’t it insane? 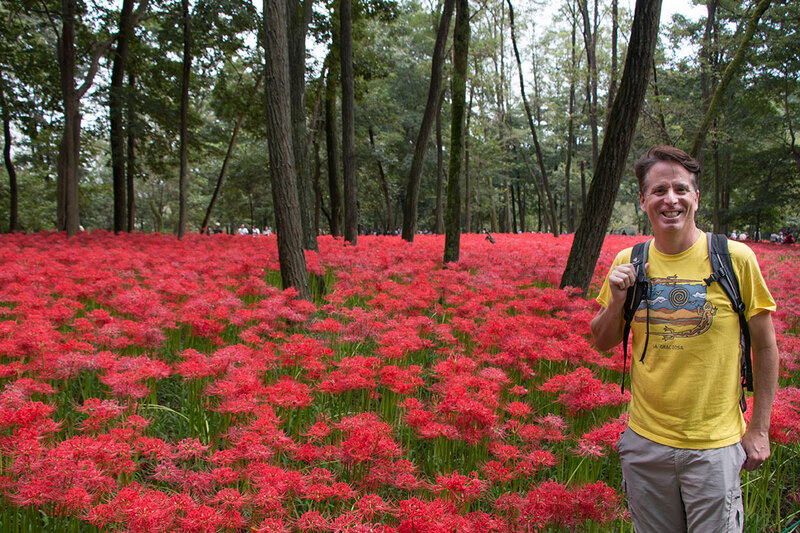 We really, really, really love Japan. Do you know if I can still visit this? There may be some flowers still blooming, but the peak bloom has passed. I noticed the park has already removed the calendar indicated the phases of the bloom. such a wonderful place. I’m just wondering what time this flower blooms like this one. It is seasonal or not? I’ve love to visit this place too. Hi Faye, Yes, it is seasonal. 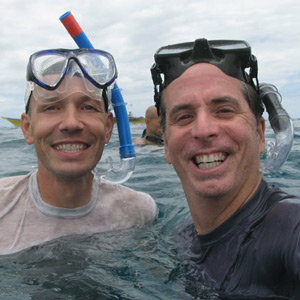 If you read through the article, it explains the timing with tips on when and how to visit. It must have felt like walking through a fairyland.